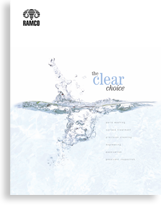 This Case History covers a custom built Five Stage Immersion Wash and Iron Phosphate System. The customer wanted to remove oil, dirt, grime and to iron phosphate steel weldments prior to painting. Hundreds of weldments were to be processed per shift. Specially designed baskets were built to accommodate four weldments at a time (each weldment was 33”L x 3”W x 24”H). The maximum load capacity was 150 lbs. per basket. The process required a heated wash, cold rinse, heated iron phosphate, cold rinse and cold seal. 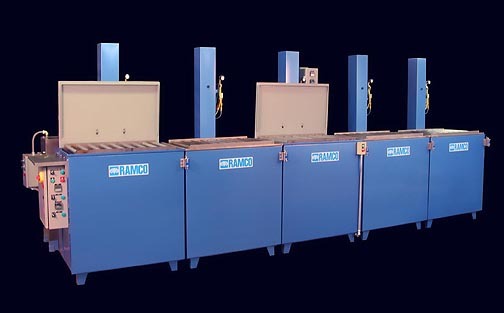 The line was designed using individual custom RAMCO MK Series agitating parts washers. 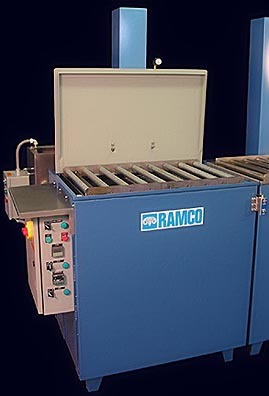 All stations included roller conveyor sections for smooth and easy transfer between stations without having to lift baskets and side mounted pneumatic controls for easy operator access. The wash and iron phosphate (heated) stations included Nema 12-control panels, digital temperature controllers, automatic cycle timers and sequenced covers. The cold rinse and sealer stations used platform oscillation only. The wash stage employed a Surface Sweep Oil Removal System (using a lateral sweep header and large overflow dam within the primary tank) to remove floating oils from the surface and route it into a remote quite tank (see below). 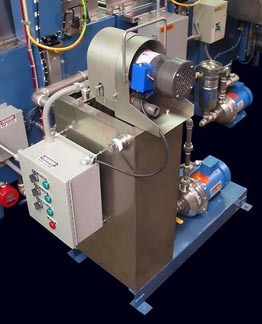 A stainless steel 2″ belt skimmer was used to automatically remove accumulated floating oils within the remote tank thereby preventing floating oil from redepositing onto cleaned parts.